Thom Yorke moaned out the lyrics to “Pyramid Song” from behind a piano, looking like 1984’s Big Brother as a half dozen video screens dangled over him showing his face through an orange filter. The take on the tune off 2001’s Amnesiac sounded even better than the studio version and the performance in Mansfield Mass might have been the best Radiohead has delivered to the Bay State in almost a decade. Click here for more of my photos on Glide Magazine. The bulk of the set list was the same as it has been on every other stop of the tour, starting off with “Bloom,” the opening track off Limbs. However, fans got a rare treat when Yorke played a verse of Neil Young’s “After The Gold Rush,” as a lead-up into “Everything In It’s Right Place.” Material from their first two albums, 1993’s Pablo Honey and 1995’s The Bends, didn’t make the cut. But Radiohead performed a handful of newer unreleased tunes that the crowd roared in approval of. “The Daily Mail” is a mellower piano-based tune that has a gradual build up and “Supercollider,” arguably the best of the recent batch of new tunes, sounds like the start of a whole new phase in their musical evolution. 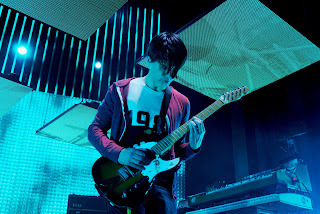 The sound mix was incredible from every corner of the venue, although during guitarist Jonny Greenwood’s solo on “Lucky,” his guitar was hard to hear over the rest of the band. Radiohead were firing on all cylinders and sound better than they have in years. If their tour is coming through your town, get tickets. Now.